Green School - Bray School Project N.S. Congratulations to the Green School Committee. 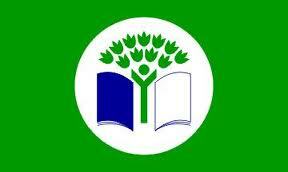 Bray School Project has been awarded it's 5th Green Flag! We were awarded this flag for the work the school has done over the last two years on the topic of Biodiversity. Coillte very kindly donated tree saplings to our school (many thanks to parent Elaine Kahn). Each band of classes planted a tree on the school grounds. 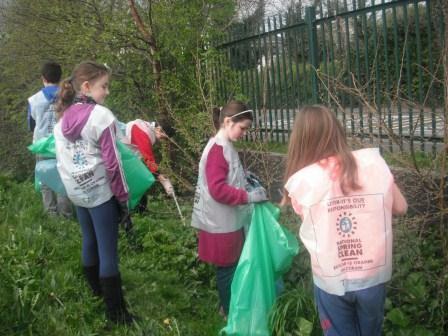 We also invited the Green School Committee from St. Fergal's N.S to plant a tree with our Green School Committee. 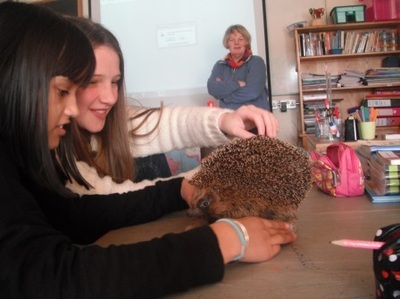 Both schools are working on the topic of bio-diversity for the Green Schools Programme. 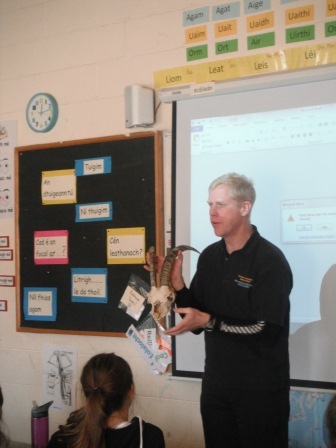 Dr. Tasman Crowe visited our school on Thursday January 30th to talk to us about Biodiversity. He is a parent in the school and works as a marine biologist in U.C.D. All classes from 2nd to 6th assembled in the hall. He told us about the wonders of the sea and showed us a video of the marvellous creatures in the ocean. This video was shot in Ireland. He told us about how humans endanger the habitats of not only sea creatures but also land and sky animals through pollution and hunting. Ecosystems can also be harmed by humans bringing plants and insects into a country that wouldn’t normally live there. He told us we are the future generation who will have to clean up the damage of past generations. We can help biodiversity by planting in our grounds, adding birdfeeders, batboxes and helping to reduce pollution by walking on Wednesday! We thank him very much for coming to speak to us! By Lilie and Lorcan – 5th Class. 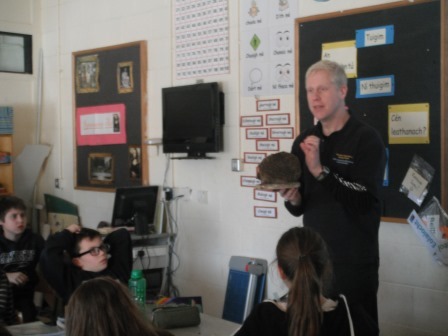 Education officers from Glendalough National Park gave workshops to senior classes on Biodiversity. They told us about the purpose of national parks, threats to biodiversity and how we can help to protect the natural world. We are very lucky in B.S.P to have such an enthusiastic group of parents who are involved in the Gardening Committee. We thank them for the work they have done with all classes in creating an invaluable outdoor classroom. We have our pond area where we can see frogspawn each spring and in the summer term we have lots of frogs hopping around the school grounds! Each class has their own garden plot. Different flowers, vegetables and berries are planted each year, and every September/October the classes get to harvest the fruits of their labour. The wild flower garden was created recently to help attract more insects to our school grounds. The logs are a great hiding place for mini-beasts as well as a fun place to play for the children! We have been looking at how we can encourage even more biodiversity and would be grateful for any suggestions you may have. Please contact Lesley Sheridan 2nd class teacher or Sorcha Maguire 5th class teacher if you would like to become involved in any of our biodiversity projects. 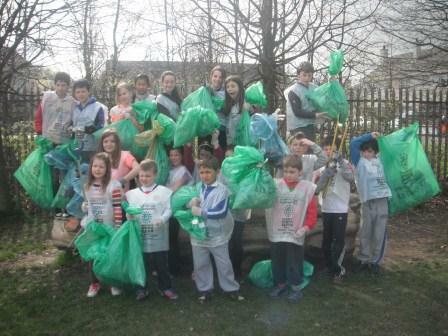 On Wednesday 24th April, the Green School Committee undertook our annual Spring Clean. 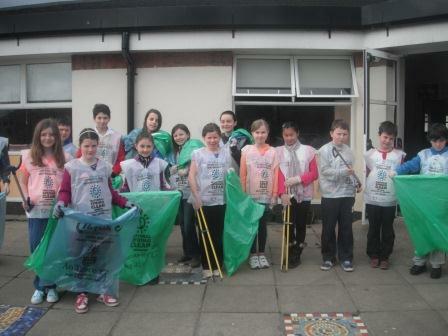 The committee used litter pickers, gloves and collection bags provided for by An Taisce and cleaned the grounds of the school as well as some of the boundary outside the grounds. They did a fantastic job, and the school grounds are looking great. Now, it's up to everyone to keep it clean!! Now that we are into spring we are encouraging as many pupils as possible to make that special effort to travel to school by walking, cycling, scooting, park and stride or by bus. Each Wednesday we find out how many pupils have participated in Walk on Wednesday, and the class with the most participants keeps the 'Golden Boot' in their classroom for the week. Well done to those pupils who have kept it up over the winter months, we hope you continue to be as active for this term!